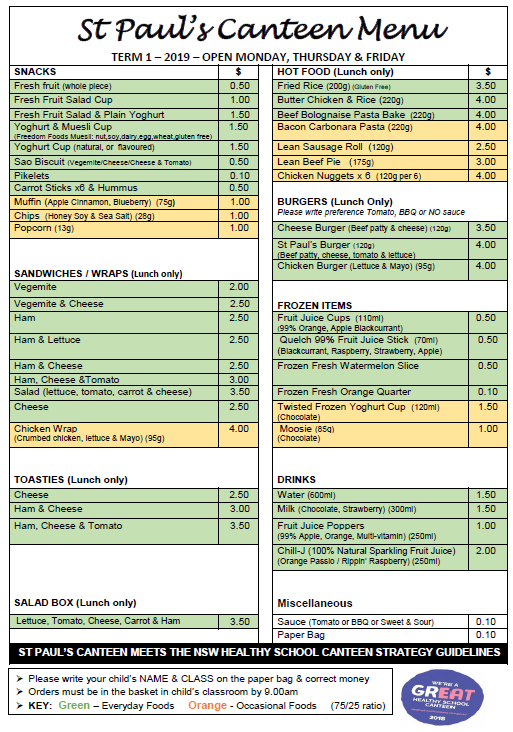 The St Paul’s school canteen operates Monday, Tuesday and Friday of every term. Our canteen accepts recess and lunch orders (by 9.00am) and sells a range of snacks and refreshments over the counter, during school breaks. We also sell fruit and water as we’re a Crunch and Sip school. Currently, our canteen is being managed by the P&F and is run by a fantastic and valued team of volunteers. St Paul’s is pleased to be able to offer this service and convenience to our families & students. 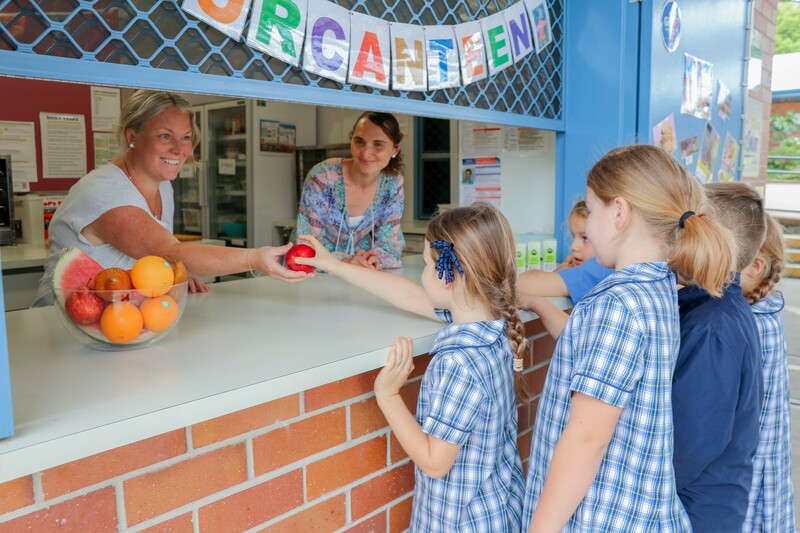 In 2018, the NSW Government released new guidelines for school canteens as part of the NSW Healthy School Canteen Strategy. In Term 2, the St Paul’s canteen was the first Catholic school in the region to complete the menu check and meet the Healthy School Canteen Guidelines. This means 75% of our menu offers a diverse range of nutritious everyday options and the remaining 25% offers ‘occasional’ items. We invite volunteers to register their availability. Mums, dads or grandparents are welcome to lend a helping hand for one day each month or split shift or even just a ‘power hour’ to help with food preparation, serving or clean-up. Please note: Volunteers must be registered with the school office and hold a current Working with Children Check number. St Paul’s, the P&F and volunteers are dedicated to working together to make our school community a happy and healthy environment for our students.